Delicious Flavors for Every Season! 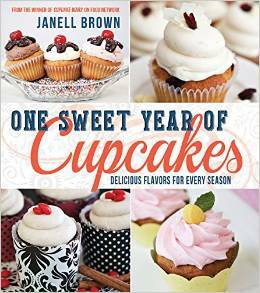 One Sweet Year of Cupcakes was created to provide the casual baker more award winning cupcake recipes that incorporate ingredients that are fresh and seasonal. This way, when you are at your local farmer’s market and see that package of freshly picked blackberries, you can return home and bake Chocolate Blackberry cupcakes. Or as the holiday season comes around, you can bake cupcakes that correlate to the holiday while enjoying the seasonal products. “Janell has completely knocked it out of the park with One Sweet Year of Cupcakes. The Cupcake Wars Winner and owner of the award-winning One Sweet Slice bakery will have you feeling like a cupcake connoisseur with her tips and tricks for making the perfect cupcake. The step-by-step instructions for each recipe are fool-proof, so ANYONE will be able to make these drool-worthy desserts. One Sweet Year of Cupcakes has a recipe for any event, no matter the time of year, that will leave your friends and family amazed and asking for more.” –Stephanie Loaiza – Cookbook Author, Co-Owner, and Sister Number Four of Six Sisters’ Stuff.